<< Why is Virtual Reality so important for the faith? Which VR Camera is best to buy? Virtual Reality cameras are still in their infancy. Undoubtedly they will improve. So, at Good News Ministries, we decided to start with the best one available for consumers (without even wishing for an expensive professional camera, which is not tempting at the “low end” GoPro camera price of $5000 — prices at the Hollywood level go up to $60,000). We embraced the $350 camera. But which one is best in that price range? To get started, we didn’t spend anything. We began with my smart phone (a Samsung Galaxy S5) and the app for shooting pictures for the Google Cardboard headset, called “Cardboard Camera”. With this, you hold the camera (steady now, don’t breathe) and slowly turn 360 degrees to make a panoramic photo. The Cardboard Camera app records the ambient sounds while you’re shooting. This is a great feature, and other VR cameras don’t have it unless you shoot a video (later I’ll explain why you won’t want to do that). When you’re done shooting, the app automatically stitches the two ends together to produce a 360° image. It’s not a perfect match-up of the two ends unless you maintained a straight-line turn while filming. And any wobble or hesitation while turning blurs that part of the photo a little. But the mismatched seam can be fixed in graphics editing software. And I rigged a video camera tripod, for it’s smooth turning head, to hold my cell phone. Here’s my first Cardboard Camera photo. You may click on it to download the full size version. It’s designed to be viewed as a 360° image through the Google Camera app, but it can be viewed with other goggles. The color balance is a bit purpley. This can be fixed with graphics editing software, but saving the revised image loses the sound effects. Next, I shot the same location with the panorama option in my phone’s native camera. As you can see, the color is much more accurate. The problem is, the panorama feature of my camera does not stitch the ends together. To make it useful for 360° VR, I used graphics editing software to match the ends up perfectly. It looks great in my Google Cardboard goggles and in websites that display VR images. To make a truly VR photo, which is completely spherical, you need to purchase a VR camera. 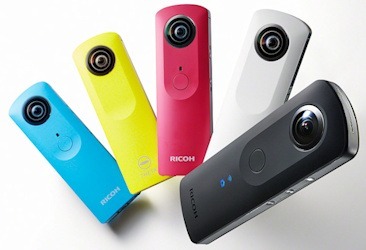 After researching everything available under $400 (in early 2016), reading reviews and looking at sample images that people produced with them, I learned that the best options were the Ricoh Theta S or the Samsung Gear 360. The Samsung Gear 360 camera does a poorer job of stitching together the end pieces to produce a truly 360-degree experience. I also don’t like that the Samsung requires one of the newest models of Samsung smart phone to pair with: the Galaxy S6 or newer. Mine is an S5, and I see no reason to upgrade to a much more expensive phone when the S5 is still working great for everything else. 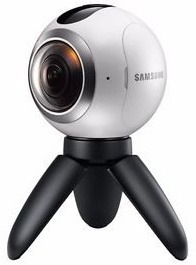 The images produced by the Gear 360 camera are also meant to be viewed only by the Samsung Gear goggles. Samsung is being very proprietary. The Ricoh Theta S, on the other hand, does an excellent job of stitching the ends seamlessly. The app works on any smart phone. Other than that, the two cameras seem about equal. These two advantages sold me on the Ricoh camera. Both cameras can shoot videos, but the video quality is lousy. No consumer-priced camera yet has a truly high resolution ability. Their videos are usable if you view them in your own device (your cell phone or your headset), but if you upload them to YouTube or Facebook (both of which hope to make VR more popular), they lose quality drastically, ruining the immersive experience of “being there” in the scene. The quality of the of Ricoh photo is worse than my smart phone’s camera, although it is much easier to use for creating a steady image. Certain lighting conditions make a better image than others, and I’ll cover that in a future post. The first photos I shot had trees in them, and the sky’s light coming through the tree tops produced purple edge-fringing on the tree branches and leaves. Ugh! As a professional photographer, I was happy to get away from purple fringing years ago when I replaced my inexpensive digital camera with a DSLR. Now I’m back to feeling like an amateur again. The Ricoh camera does not render colors as accurately as my phone’s camera nor as sharp. Graphics editing software can improve that somewhat. Mine includes a feature that fixes purple fringing, but in this case, there was too much fringing and not enough fixing. More time spent on optimizing the colors improved it further, actually making the fringes more blue than purple, which I can accept more easily since it’s the color of sky (although when the bright light of the sky is shot through trees, that part comes out white, not blue). 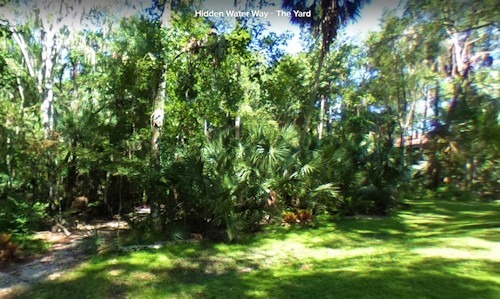 The good news is: After uploading the spherical photo into a website for displaying it (another future post will discuss such websites), the tops of the trees look far enough away that the purple is not noticeable — at least not enough to distract users from the “wow” factor of the VR experience. This entry was posted in Exploring VR on September 7, 2016 by Terry Modica.